In New Mexico, Billy the Kid is involved in the Lincoln County War, kills many rivals and eventually becomes a wanted fugitive. He led the last great outlaw raids ! Bill Doolin: I've got a rule of my own that might do you good to remember: there will be no killing unless it's forced upon us. Parolee Audie Murphy violently resists a crooked district attorney's latest attempt to railroad him, based on his friendship to members of the notorious Dalton gang. Breaking parole, he ends up having to join the gang for real and becoming the new leader. 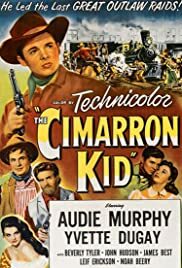 Though not quite as good or well-written as director Budd Boetticher's later series of Randolph Scott pictures, The Cimarron Kid is still a fairly entertaining, muscular pulp-western, with Boetticher's usual flair for excellent photography. With his good looks, youthful appearance, and short stature (not to mention his hero status), I'm a little surprised at how many times Audie Murphy was given a chance to play an anti-hero (Night Passage, The Texican) or even a nasty villain (No Name On The Bullet). He's charming enough though, that the audience forgives the Cimarron Kid long before the law ever does. Noah Beery Jr. gives an amiable, though far-too-short performance as the fun-loving Bob Dalton, while a young James Best and Yvette Dugay are pretty good too as a fellow member of the gang and his beautiful, though savvy love interest.